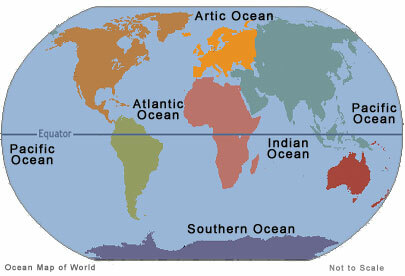 The Pacific Ocean is the largest of the world's five oceans, followed by the Atlantic Ocean, Indian Ocean, Southern Ocean, and Arctic Ocean. World Ocean Day began on 8 June 1992 at the Earth Summit in Rio de Janeiro, Brazil. However, it is not an officially recognized secular holiday by the United Nations as of yet. World Ocean Day is an opportunity every year to honor the world's ocean that connects us all, celebrate the products the ocean provides, such as seafood, as well as marine life itself for aquariums, pets, and also a time to appreciate its own intrinsic value. The ocean also provides sea-lanes for international trade. Global pollution and over-consumption of fish have resulted in drastically dwindling population of the majority of species. The ocean covers 71 percent of the Earth's surface and contains 97 percent of the planet's water, yet more than 95 percent of the underwater world remains unexplored. The ocean and lakes play an integral role in many of the Earth's systems including climate and weather. The ocean supports the life of nearly 50 percent of all species on Earth and helps sustain that life providing 20 percent of the animal protein and five percent of the total protein in the human diet. When an ocean dies, so does the planet. Well, not exactly, we'll..